When helping our clients plan their custom home in Northern Michigan, the kitchen is one of the most scrutinized rooms. After all, it is one of the most important rooms in the entire home and sees more use than any other. Details in the kitchen really do matter – aesthetically and functionally. Kitchen backsplashes are meant to protect your walls from damage and enhance the beauty of your kitchen. The ideal backsplash will be easy to clean, and resistant to heat, water, and scratches. Consider the following materials for your perfect kitchen design. This is an affordable and very versatile choice with and endless number of styles and patterns. The grout must be sealed for better durability and, so it won’t absorb water. It’s also easy to replace any sections that might get damaged. Durable, affordable, heat resistant, and easy to clean, Stainless Steel has a lot to offer. It can be dented or scratched although it takes quite a bit to do so. Natural or painted, brick is durable and heat resistant. It needs to be sealed and does require more frequent cleaning. Brick can add a charm or warmth in the right setting. Popular for countertops, Granite is an easy choice to extend the same look throughout the kitchen. A natural beauty that’s easy to clean and tough. It’s porous so it will need to be sealed to prevent staining. Like granite, marble has a wonderful natural beauty but also requires periodic re-sealing and falls on the pricier side. Another popular countertop material, Quartz is most commonly used as a composite material. Natural quartz stone is mixed with resin to fashion a tough material that stands up to heat, stains, water and is more scratch resistant than most stone. Because it is a composite, it can be fashioned with shapes and curves that would otherwise be difficult or expensive in granite or marble. Probably the most affordable material, it is sometimes overlooked. While it is not heat resistant, it does clean easily and is durable. It comes in a myriad of colors and patterns; some of today’s modern laminates can almost pass for real stone. Whether you are building a new home or remodeling your existing house, Mason Construction is dedicated to quality construction with meticulous attention to detail. Contact us today to discuss your home building or remodeling needs. Whether you are building your new dream home or remodeling your existing home, choosing the right material for your countertops is no easy task. The variety of materials and the selection of finishes and colors is vast. Your choice will likely be influenced by your personal style, your home décor, and perhaps the scenery around your home. Here in Northern Michigan we are blessed with a rich palette of natural beauty. No matter what inspires your choice, here are a few tips to help you decide. Both are great materials with each having advantages. Available in a multitude of colors. One of a kind. Natural variations in color and veining means that each counter top will be unique. Low maintenance. Just wipe down with warm water and mild soap. Non-porous and non-absorbent. It won’t draw in moisture from food that can harbor bacteria. It’s made from quartz stone and resin. The resin adds durability and greatly reduces the risk of fracture or chipping. Wide variety of colors and finishes. Since Quartz is a manufactured surface, an almost infinite number of looks are available. And yes, you can get Quartz that looks just like granite. Regardless of material, reasonable caution should be used. Always use a cutting board! Don’t cut directly on any countertop. This is especially true with ceramic knives or any other high-end cutlery that can scratch almost any surface. Use a trivet or potholders. Don’t place hot pans directly on the countertops. This can scorch or burn the surface. Wipe spills as soon as possible. Granite may become discolored or stained if a spill is left too long. While quartz may more stain resistant, don’t delay cleaning any longer than necessary. Neither material is necessarily costlier than the other. Price varies by brand, surface finishes and styles, and edge style. An exotic piece of stone will cost more than a common variety. There are many other options for countertops that you can consider. Just a few other options include Soapstone, Tile, Marble, Butcherblock. Stainless Steel, Concrete, Recycled Glass, and Laminate. Each of these have unique properties and appearance. It all comes down to your personal style and budget, and imagination! Open shelving in kitchens, most often stirs up one of two reactions: You either like or dislike them. We think that the open shelving we did for the owners of a Lake Michigan home turned out quite extraordinary. We can’t take all the credit however, as the homeowner beautifully organized the shelves. The result is visually appealing as you can see. The combination of warm white cabinets and shelves with natural wood counter tops give the kitchen an organic, cottage-like feel. The entire space exudes warmth and hospitality. The reasons to like open-shelving is apparent. Open shelves provide an opportunity for one to display dishes and collectibles. They are a great design element that can make a room look and feel bigger. Some may say that open shelves tend to give a European flair to the room. They can be functional by eliminating the need to open and close doors as everything is clearly within sight and reach. People who like open shelves may find the necessity of keeping them tidy as an incentive rather than a deterrent. People who do not like the idea of open shelves normally loathe the idea, feeling that the necessity to keep them organized and clean is the source of their disdain. The visual effect of open shelves may also be seen as clutter rather than art to them. There are many open kitchen shelving ideas out their, you might just like it. What side of the open kitchen shelving debate do you fall on? Mason Construction is all about improving your quality of life. We genuinely care about people and our community. We have integrity. We specialize in building quality custom homes and home remodeling projects. If you are looking for a reputable custom home builder, please contact me at Mason Construction (231) 642-0724. As a custom home builder for Northern Michigan, Mason Construction clients often embrace cottage style and lake living. Our minds often relish in the visions of summer and beach activities. With winter just around the corner, we would like to offer a different perspective, one that includes soft fluffy snow, crystal ice-topped lakes, warm companionship, and winter recreational activities. Traverse City and its surrounding communities have so much to offer the outdoor enthusiast during the winter months. Consider snowmobiling, skiing/snowboarding, cross-country skiing, tubing, tobogganing, and snowshoeing. Traverse City True North is a wonderful resource and great place to start when making your outdoor recreational plans. You can even download a mobile app called Experience 231 that offers locals access to over 300 year-round outdoor activities. Winter is also a time to savor the comforts of home. Home is where family and friends can gather around the warmth of a fire, snuggle up in blankets, and sip on warm drinks. Home is where the candles are lit. It may be time to dust off your favorite boards games, or learn a new game perhaps cribbage, backgammon, or chess. Its fun to play the oldies but goodies like checkers, Monopoly, and Life. During the summer months you may not make reading a priority. Winter is a good time to visit our local Traverse City District Library or bookstores. We have a great selection of bookstores to choose from such as Horizon Books, Brilliant Books, and The Bookie Joint which is the city’s premier used book store. Why not indulge in a new book, something fictional just for fun, or non-fictional for personal growth? Get into the kitchen to try out new recipes. Did you know that Oryana, Fustini’s and Northwestern Michigan College offer cooking classes? Why not take a class, then put on a new apron and utilize your own home kitchen creating a fabulous new dinner for your family and friends during the holidays. Whatever activity fills your senses ~ do that! Mason Construction is all about improving your quality of life. We genuinely care about people and our community. We have integrity. We specialize in building quality custom homes and home remodeling projects. If you are looking for a reputable builder, please contact me at Mason Construction (231) 642-0724. Mason Construction takes pride in the fact that we will always keep our jobsites clean. We insist on creating a professional atmosphere at all of our job locations. This should be a standard among all builders but unfortunately it isn’t. Keeping a jobsite clean throughout the entire building process not only impacts everyone’s safety but also helps to increase productivity. New construction clean-up is different than what many people consider “residential cleaning”. It really consists of three phases: A Rough Clean, Maintenance Clean, and Final Clean. The “rough” clean-up, is performed once the exterior walls and framing of the project are complete. Large debris is removed from the interior as well as the exterior of the building. It generally, involves a rough sweep/shop vac of the floors as well. The goal to remove and haul away as much debris as possible, removing materials no longer being used, and eliminate as much dust as possible from the work area (including heating vents). The “final” clean-up, is performed once all the construction has ended and the building is complete. This phase is quite detailed. It requires stickers and decals being removed from all surfaces including interior and exterior windows. Putty, paste and adhesive is removed from floors, tubs, sinks and showers, All cabinets and drawers must be vacuumed to remove the dust then wiped clean. Floors and carpets are cleaned. Light fixtures, mirrors, appliances, counters, ceiling fans, vents, hardware, and cabinetry are cleaned. A touch-up is sometimes required at the end if a contractor needs to address something on a punch list. The end result is a turn-key, walk in ready home. If you are looking for a reputable builder, please contact me at Mason Construction (231) 642-0724. Being part of the Glen Lake Cottage renovation has truly been a fulfilling experience for me as a contractor. Having the opportunity to renovate a home filled with memories dating back to 1927 brings a smile to my face. The Glen Lake Cottage project was the epitome of preserving the vintage, while infusing the modern. It was a project where I was able to combine all of my trade skills from building, remodeling, to finish carpentry. What started out as a summertime vacation spot for guests of the Glen Eden Resort in 1927 soon became a summertime sanctuary for White-Schilling family in 1940. The dwelling boasted of components that many would consider of a cottage lover’s dream. A primary endeavor I was given working on this home was to preserve and refresh the existing beadboard cabinets, replicate them, adding additional beadboard cabinets in the same room. Attention to detail was of utmost importance as the room needed to look uniform. This required excellent finish carpentry skills. Beadboard cabinets have a history in and of themselves. Beadboard originated as an inexpensive millwork sheathing that was made from scraps commonly used in seasonal homes, beach houses and cottages dating back from the 1800’s. The ridges between the planks are known as “beads”, thus the name beadboard was derived. The rustic elegance that beadboard provides today, still makes many swoon. It’s one of those building materials that just never goes out of style. 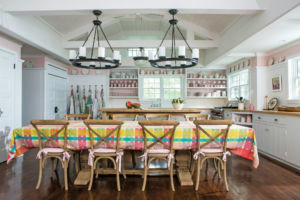 Overall, the completed project would be described by many as being “cottage eye candy”. The beadboard work was just one aspect of the overall transformation that took place at Glen Lake. As a team, we literally raised the roof, with over the top, artful combinations of vintage and modern elements. If you are interested installing the beauty of beadboard or creating a vintage, modern milieu in your home or cottage, please contact us at Mason Construction by calling today (231) 642-0724. Spring Cleaning and New Beginnings …Remodel or Build New? It is something we just can’t avoid, that itch to start fresh each spring! For some, it involves cleaning, changing decorations based on the holidays, recycling furniture and replacing linens with items lighter and more seasonal. That said, sometimes the spring resurfaces that desire for MAJOR change…Remodel to create more space, redesign existing space, add a seasonal room OR building new in order to accomplish the changes you desire. With home prices depressed and the resale market slow in the last several years, many homeowners with life changes or structural needs, have chosen to remodel their existing homes as a way to freshen up and redesign their living space. Home equity loan rates have been desirable offering homeowners with significant equity assurance when borrowing on a home they intended to remain in for many years. Sometimes, the option to refinance for remodeling purposes has allowed homeowners to reduce their interest rate while keeping their payment the same, even following remodeling costs. Further, studies have shown over time that investments in kitchens, bathrooms and even outdoor livings spaces in northern Michigan add value that will remain for many years and through resale. As the housing market begins to rebound, making the decision to remodel or build new becomes more challenging. As housing prices creep upward, gaining on the pre-2008 values, some homeowners may be hopeful that a “For Sale” sign will result in their ability to start fresh recouping their investment and walking away with funds for a new beginning. 1. Where are you in your family life? Just beginning to have children, in the middle of the teen years, empty nester, new grandparents, assisting aging parents in a different community? If you are just beginning family life, assessing “room to grow” and flexible spaces will be pivotal to your decision to remodel or rebuild. A walk-out lower level in your home could be divided in to two bedrooms as your family grows. Large, unfinished spaces are fabulous gathering places for healthy, teen activities right in your home. Further, they could even be made in to efficiency apartments for aging parents who may need seasonal or occasional assistance from family members. 2. Where does employment factor in to the location of your home? Do you work from home, commute on public transit, drive your car alone at night? If you work from home, having a dedicated space that separates work from personal life can help create a healthy balance in your family. Redesigning a bedroom, den or large closet can offer a small office like environment with very little cost. If you commute a long distance to your place of work, perhaps remodeling is not appropriate if you anticipate a career position with your company. You may be better served economically and logistically by building closer to your place of employment. 3. Does your current neighborhood, village, city or state offer the climate of social, cultural and weather conditions that satisfy you? Are you happy with the lifestyle that your current community allows you to lead in your current place of residence? Do you escape from urban settings every weekend to find the woods, or do you come in to town twice each weekend just for night life? If so, remodeling may not create the sanctuary you desire, if you always have to leave it to enrich your life with those activities that you are passionate about. That said, if you love living away from it all, and currently reside in a remote area…remodeling offers you a chance to create the “nest” you’ve always craved. 4. Physical practicalities…are you able to navigate your current floor plan, have any health issues, are their structural items that need major attention before you can invest in the design and decorating? How tolerant are you of disorder should you decide to remodel OR do you have somewhere you could move temporarily until remodeling is complete? Does your current floor plan, and condition of your house, lend itself readily to remodeling or are their infrastructure or accommodations that need to be made that might cause expense to exceed return even before you get to the fun stuff of new paint, furniture and decorations? If you need a new roof, cracks in the foundation repaired or rewiring before you can begin to redesign space for pleasure, perhaps leaving the heavy lifting to a new owner who loves the current layout would be your best option to achieve the next dream home you have in mind. Assessing your own tolerance for disorder, contractors in and out, as well as noise and some disruption in your family routine will also be a pivotal factor in determining if you are a candidate to live in/with remodeling or if building new would be best for you. No matter where you are in the process of considering refreshing your living space, Mason Construction is here to provide advice, support, resources and the professional standard of building you’ve always heard is our reputation. Give a call, review our portfolio and let us help you realize that new beginning you’re dreaming of this Spring. The idea of custom construction can be overwhelming. From inception to creation, many steps are taken to ensure vision becomes reality. Your residential project is no different. You are unique; your needs and desires stem from every aspect of your personality. Your family is unique. Your identity together sets the tone for your family’s legacy. Your home is unique. From location and layout, to brick and wood, your home is the extension of who you are and who your family is. You are going to build a home where who you are meets where you are. Mason Construction brings the reality of you and your family’s identity through the process of making vision become reality. One crucial step in that process is structure and design. The design of your home touches personally on every level. Your project may require the help of experienced engineers and architects. Here is a list of a few local firms that could help. All are reputable and could be an asset in planning your dream home. Cornwell Architects, “Cornwell Architects is a second generation, practice-led business of architects focused on the goals of our clients and the growth of our community. Over the past sixty-five years, the firm has earned a reputation as a comprehensive, multi-disciplined firm with successful projects located throughout Northern Michigan. These teams solidify the vision of your project on paper, extending your personality and needs into the project itself. Mason Construction will build your vision and bring it to life! Energy efficient homes save homeowners money on their monthly utility bills, while improving the home’s overall comfort by reducing drafty spots and extreme temperatures. When considering your next home or remodel, here are 5 easy ways to go green and save up to hundreds of dollars each year on energy. Energy Audits – The very first step to making your home more energy efficient is to hire a professional to perform an assessment of your home’s energy performance. Energy audits identify where your home may be leaking hot and cool air and show you the most cost-effective ways to reduce energy waste in your home. Insulation – Installing or adding insulation to a home’s walls, floors and attic is typically one of the most cost-effective ways to improve your home’s energy performance. Air Sealing – Like insulation, air and duct sealing provides a great bang for the buck with respect to its low costs and big energy savings. Air sealing simply involves finding where hot and cool air may be seeping out of holes in walls, ceiling or duct work and sealing them with caulk and weather-stripping. Upgrade Appliances and Electronics – Most home appliances and electronics use electricity. Thanks to advances in technology, most appliances and electronics now have a high efficiency counterpart. When in the market for a new home or remodel, look for the Environmental Protection Agency’s Energy Star label, which indicates that an appliance performs the same type of function for less energy. Space Heating and Cooling – The energy to heat and cool homes typically accounts for more than half of all energy consumption. Like your home’s appliances, Energy Star has also created high efficiency air conditioners, water heaters and furnaces that can keep your home at optimal temperatures while using significantly less amount of energy. The team here at Mason Construction would love to help you evaluate the best ways to “Go Green” on your next remodel project or new home. We have built LEED certified homes, and we stay current on the best practices for energy efficient home building. If you have any questions about energy savings and quality home construction or remodeling in northern Michigan. Please give Chris Mason a call at 231-642-0724. We proudly serve Beulah, Frankfort, Elberta, Honor, Interlochen, Leelanau, Lake Ann, Traverse City, Empire, Glen Arbor, Manistee, Suttons Bay, and the surrounding areas. Copyright© 2019 Mason Construction LLC.